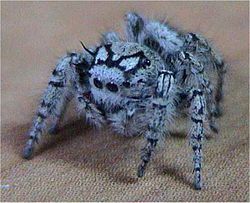 The jumping spider can be found mainly in tropical regions, but occur in habitats ranging from rain forests to mountains. Everywhere if the sun is shining, these types of spiders will enjoy being on trees, grass and rocks. 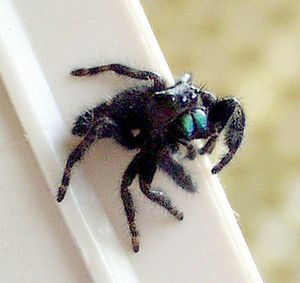 Jumping spiders come in many colors and are all about the same in size; which is about the size of a pea (two cm). Like all spiders they are divided into three main sections: the head, the thorax, and the abdomen. Jumping spiders jump in order to get from place to place and use their strong short legs to jump up to 20 to 80 times their own body length. They all have eight eyes and have two big simple eyes at the front of the head. All of their eyes give them a 360-degree eyesight. Spiders have singular eyes like mammals, which means that they see everything whole, and not like other insects which have compound eyes and see everything in a bunch of little pictures. Their eyes can move in and out for focusing and they can turn up and down and left and right. Poised to jump (Phidippus audax). Salticus scenicus with a fly. This page was last modified on 9 January 2009, at 20:11.